Spencer was a devout Christian and believed God resided in all things and the miraculous could be found in everyday events. In his paintings, Cookham – the small town on the Thames where he lived – becomes the setting for scenes from the life of Christ and other Christian narratives. This is one of a series of scenes from the Passion of Christ. Carpenters walking down Cookham High Street form a link with Christ’s carrying the cross through Jerusalem. Canvas, 60 1/4×56 1/4 (153×143). Presented by the Contemporary Art Society 1925. Coll: Purchased by the C.A.S. from the artist through the Grosvenor Galleries 1921. Exh: Nameless Exhibition, Grosvenor Galleries, June 1921 (19); C.A.S., Paintings and Drawings, Grosvenor House, June–July 1923 (122); Tate Gallery, November–December 1955 (17). Lit: Wilenski, 1924, pp.27–8, repr. pl.15; Johnson, 1932, p.331; Wilenski, 1933, pp.284–5, repr. pl.131; Chamot, 1937, p.74; A. Bertram, A Century of British Painting, 1851–1951, 1951, p.105, repr. p.190 (in colour); Spencer, 1961, pp.158, 167; Collis, 1962, pp.20, 25, 68–9, 243. Repr: Rothenstein, 1945, pl.14; Newton, 1947, pl.3 (in colour). The artist described to the compiler in conversations and letters at the time of the Tate Gallery exhibition in 1955 how the painting underwent various changes in composition. ‘The movement of the way to Calvary passes from the right to the left. Rather the movement of a breaker approaching a shore... The Cross as far as its position in the picture is concerned is right enough, but I still feel it a pity that I failed to arrive at the notion I hoped for. I had made several drawing attempts of the Cross and disciples ranged somewhat procession-wise either side of it, some of the soldiers helping in the carrying of the Cross,...some escorting them.’ This idea was considerably modified to obtain greater clarity of composition. A pencil and sepia wash working drawing for this composition (14 1/2×13 3/8 in.) 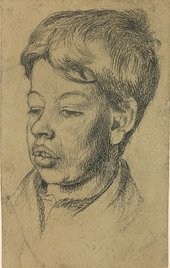 was lent by Richard Carline to the Arts Council's Drawings by Stanley Spencer exhibition, 1955 (25), and was acquired by Carline from the Goupil Gallery exhibition, 1927 (15). Another drawing (10×9 in. ), showing a detail of the house on the left, was presented by G. G. Shiel to the Stanley Spencer Gallery, Cookham, and is reproduced in that gallery's exhibition catalogue, summer 1963 (27).